Is there anything that isn’t for sale? Is there anything that is for sale but shouldn’t be? Just to pick a random example, should, say, I don't know, a minister’s sermon topic be up for sale? Or would that violate our longstanding tradition of the free pulpit – that whoever the congregation calls to fill its pulpit is expected to speak from his conscience on the topics that he discerns, using his unfettered judgment, will be most needful and beneficial for the moral and spiritual improvement of the congregation? The free pulpit is not for sale! my answer was swift and unequivocal. Whatever the last auction bid was, plus 10 percent. Ironically, the topic this member was keen for me to preach about was what should and shouldn't be for sale. The member had read a recent article in Atlantic monthly: Michael Sandel, "What Isn't For Sale?" (see here), and wanted to hear my reflections and have the issue brought before the congregation. I did cravenly name a price -- because I could use good topic suggestions, trusted that this member would have one, and figured that going up to two "sold" topics a year would not hinder my ministry. Despite evident willingness to name my price, virtue and principle did prevail. As it turned out, I ended up taking up the topic because my conscience commanded that it be addressed, not because I was bought off by the promise of a contribution to the Fellowship coffers. The deal was not closed, and, to my knowledge, no one made or promised any contribution specifically for this topic. Now that we have established that one thing that is not for sale (after all) is the minister's sermon topics, we can ask: is there anything else you can’t buy? What can’t you buy? 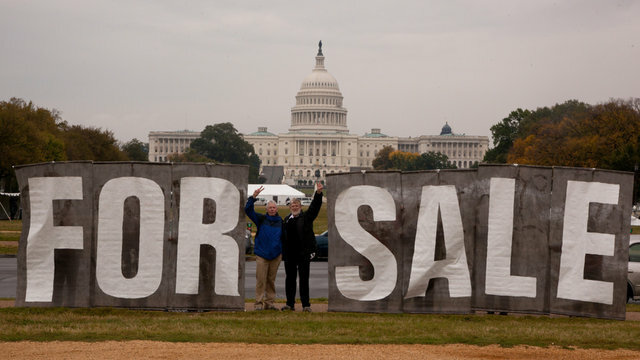 It’s an election year, and we are inescapably reminded that democracy is for sale. The election doesn’t always go to the biggest spender, but (a) it usually does, and (b) it never goes to those who don’t spend a lot. It has never been cheaper to give access to the whole world to everything you have to say. You put up a website: pictures, videos, graphics, text. Everyone in the whole world can check you out, check out your opponent’s web site for the criticisms of you, and then can check out independent websites like politifact.com to see which factual claims are true. It has never been cheaper and easier to make all the information a well-informed electorate needs readily and universally available. And a well-informed electorate has never seemed -- to the candidates, to the press, and, indeed, to us, the electorate -- more irrelevant. We expect our candidates to spend a lot of money – we won’t take them seriously if they don’t. Never mind your integrity, your intelligence, your ability to work well with others to get things done, your compassion, your down-to-earth practicality, your values, or stands on the issues. If you aren’t spending a million dollars, you obviously aren’t a serious candidate. It costs, on average, $1.4 million dollars to get a house seat in Congress. So candidates spend 75 percent of their time fundraising – and almost that much time after they get in office. You might be old fashioned enough to think that elective office is not the sort of thing that ought to be for sale. What we are seeing is marketplace creep: that is, the logic of the market – where everything is about buying and selling – has been creeping into more and more corners of life. This is Part 1 of "Not For Sale"
Next: Part 2: "Some Unusual Gift Ideas"